There is no such thing as reality, reality is what you perceive to be real. 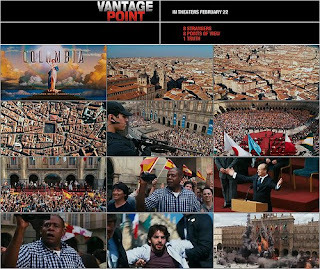 That is one thing that Vantage point pushes on to the viewer with a lot of impact. One incident looked on by different people differently, multiple views - each decoding the entire landscape of things happening at a place. No one has a complete view of everything and everyone contributes to the story from where they are. The premise of this movie is definitely challenging. Telling a story of how 15 mins worked for all its central characters showing different point of views of the same event and also moving the story ahead at the same time is difficult and I feel the director Pete Travis, has done a marvellous job in shooting it. But even before starting to talk about movie I would go out of my way and appreciate the screen writer Barry Levy for writing such stuff. One of the tightest and best screenplay I have seen for a movie in recent times. The incident is not very complex. There is a summit in which president of USA Ashton (William hurt) is participating with the Spanish authorities for Anti-terrorism movement. There are mixed reactions from the people in Spain on this as he reaches the place for the summit. Once he finishes his speech, someone shoots him. This is followed by 2 bomb blasts one at the podium there and one outside somewhere. This same incident is shown to the viewer with multiple perspectives of people who are reporting it - the media - represented by Sigourney Weaver as Rex. 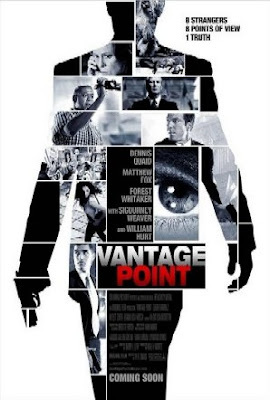 The other perspective is of the secret agents - Barnes and Kent (Dennis Quaid and Matthew Fox), they try and find who is the culprit, post the event. Then you have the perspective of President Ashton (William hurt) . Add to it a common man perspective - an American who is overwhelmed by the presence of American president in Spain. Howard Lewis (Forest Whitaker) is a simple man who puts his heart first, loves his family and is having a bad patch in life. His camera captures the most important cues that takes the movie forward. Then there is a view of a Spanish Cop Enrique (Eduardo) and his girlfriend Veronica (Ayelet Zurer) - how their acts make the whole incident move and end is interesting. Lastly and the most interestingly there is this terrorist's perspective with a beautifully acted role of Said Taghmaoui (Suarez) as a cool, smart and menacing terrorist, who is as he says smarter than Americans. He is assisted by a few of his allies. Putting so many perspectives of an incident with complex causes and effects and developing the each of the character in 90 mins - making us understand what are the drives for each one of them seems like a mammoth task. And surely the screen writer has succeeded in making that happen along with the director. Every 10 minutes the movie reveals itself a little more. Its like story doing a striptease in a slow and entertaining fashion :). The only thing that I thought spoiled the power packed action was the end. It was just too quick and too unbelievable to get everything at the same place co-incidentally. The end leaves you a little unsatisfied. 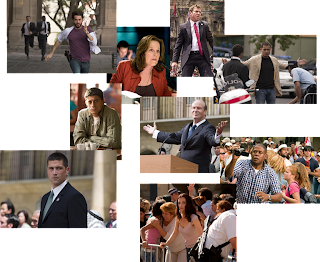 Actors have done fabulous job with Dennis Quaid and Said Taghmaoui leading the pack. The best part of the movie is that the actors did not have to command the screen, everyone had to underplay their characters as everyone was equally important and each of them have done perfectly well. Ayelet Zurer as confident independent Veronica impresses the viewer for sure. A good screenplay assists the editor well. Stuart baird does fair in his job. At times though you feel that you are watching the same seen again, as he spends more time on the incident and less on characters. Atti Orvarsson's music too is adequate. Did not find it extraordinary. Same was the case with Cinematography by Amir Mokri which in parts was extraordinary but was average in some other parts. Overall its a thin story line, with a dissatisfying ending but fabulously written, directed and acted. You need to watch it to make your own view. But for me it easily goes with a 3*.